Zeffri Yusof (left), Head of Communications and Public Affairs, Google Malaysia, presenting the Best Overall Performance Award to the winning team of Bachelor of Public Relations (Hons) students. Who said you cannot learn and have fun at the same time? 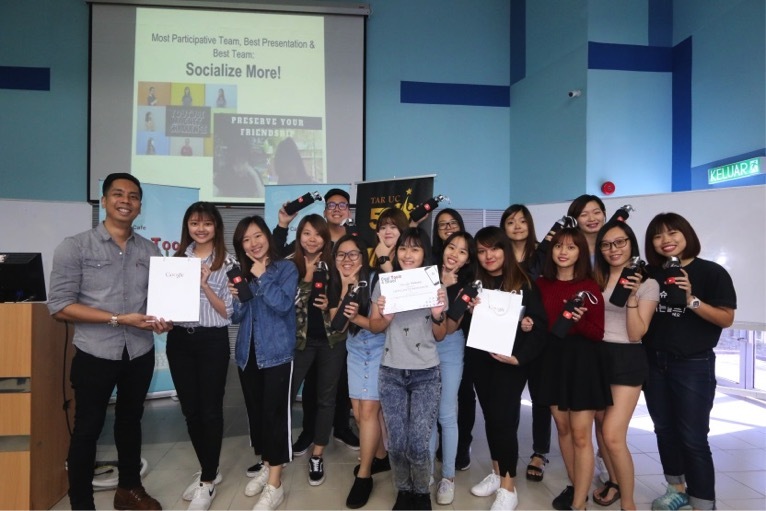 TAR UC’s Bachelor of Public Relations (Hons) second-year students took that notion to heart when they ran an online awareness campaign titled “Cool Tools 4 Skool” which ended with a huge success. In a collaboration with Google that lasted 12 weeks beginning in June 2018, students took up a challenge as part of the coursework to produce a series of educational yet entertaining content that taught their peers on how Google tools helped students in their studies and campus life. Divided into five teams, students were required to work on the campaign from the ground up by researching, planning and producing two videos per team according to their assigned themes. The project did not end after uploading the videos on social media, as teams also had to manage engagement on their content, analyse the data and presented their findings at the end of their campaign. The students made good use of popular elements such as social challenges, pop culture trends, and popular online games to make their videos more appealing to their target audience and maximise the engagement and effectiveness of their content. Ms Lim Siz Siz, Programme Leader for the Bachelor of Public Relations (Hons) under the Faculty of Communication and Creative Industries (‘FCCI’), explained that this campaign would help students understand the industry via practical applications, realistic planning and real-time project management. “When conducting lessons and in guiding the students, we placed great emphasis on realistic planning and project management, while trying to ensure that they are able to learn the practical elements of an online PR campaign. “We also made sure our students came away from lessons with increased digital literacy, as they were encouraged to use digital tools, like Google Forms to conduct surveys for their research, and Google Classroom, to communicate and collaborate at every stage of the project,” said Siz Siz. Zeffri Yusof, Head of Communications and Public Affairs of Google Malaysia, was amazed at how well TAR UC students managed to come up with videos which were entertaining, fun and effective. “At Google we’ve always felt that being useful is great, but being useful and fun is even better. The amazingly entertaining and educational content that the students have produced for this coursework and campaign has truly embodied the hard-to-pin-down ‘Goggleyness’ side of Google; bravo to each and every one of them,” he said during the closing ceremony of Cool Tools 4 Skool campaign held at TAR UC’s Kuala Lumpur Main Campus. The ceremony witnessed all students being presented with Google certificates for their work and one of the teams being awarded the Best Overall Performance award. The winning team will be treated to an exclusive visit to the Google Malaysia office for their outstanding achievement. Bachelor of Public Relations (Hons) students showing their Google certificates at the “Cool Tools 4 Skool” closing ceremony.